Free dance school marketing ideas help dance schools to grow while still paying attention to the bottom line. A dance school teaches you how to dance but they are still a business. It costs money to run a school and the best way to bring in revenue is to increase the roster of students. Larger dance schools are capable of doing so much more than smaller schools because they have the funds. If you own a dance school and want to increase its size, marketing may be your answer. It educates potential students about the programs the school offers. This includes important information such as class dates and times, dance styles, tuition, size of the classes, and the number of instructors. It spreads the word about your school to a wider audience. It helps increase recognition in the dance field by gaining notice from other schools and instructors. If conducted properly, marketing can even gain sponsorships from dance equipment retailers and companies for competitions. The best marketing plan is designed to gain recognition and attract new students. There are many specific ideas on how to carry this out but when looking for free marketing ideas, use these three basic concepts. Fundraisers: Fundraisers are a great way to raise money. With a fundraiser, you can use free materials or a service to earn money. Some of the best fundraisers include a car wash, bake sale (although you will have to buy the ingredients), and raffles. Local Community Events: Your local community is one of the best sources for free marketing. Participating in local events is a good way to reach your target audience. Some good community events to get involved in are charity events, community fairs and parades, and seasonal events. Online Social Media: The Internet has opened up a completely new avenue of marketing possibilities. With free social network sites such as Facebook and Twitter, you can build a network of friends and contacts to help support your dance school. There are tons of free dance school marketing ideas. While marketing may seem easy to some, if you have never done it before it might seem daunting. The following are some ideas to market your dance school. Create a website for your school. There are many free web-hosting providers that do not require monthly fees. Offer discounts to new students for the first month. Set up a booth at local events. This allows you to get some face-to-face time with the public and talk about the benefits of dance. Sell tickets to a dance event. 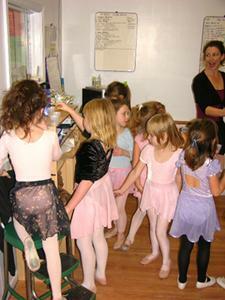 One of the best ways for a dance school to raise money is to hold a dance performance for the public. Sell specialty items such as candles, cookies, and other candies. There are suppliers that will provide the product in exchange for some of the profits. Hold a bake sale. This one is tricky because you do need ingredients. However, if you can get some of your dance members to donate the ingredients, then everything that you sell is profit. Provide a service such as a car wash. Create a page on a social network such as Facebook, Twitter, or MySpace. Use a web banner to advertise on other dance sites. You can even link it to your website, thus increasing your online traffic. Start a monthly newsletter, email it to current and new students. Ascending Star Dance - An online dance magazine, they give great advice for both dancers and schools, including marketing advice. Dance Teacher Web - Another great site with helpful tips and advice for dance instructors and studio owners. Fundraising IP.com - This fundraising website has many suggestions on fundraising, including an article specifically for dance schools.